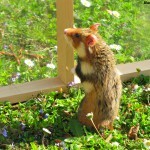 The ONCFS has been a committed partner in the hamster project since 1996. They are given various assignments such as calculating the species-specific populations by counting their burrows, understanding their decline by undertaking individual monitoring and reinforcing the most fragile populations. Three videos were made to highlight this work. Each year after the European hibernation, the ONCFS officers wander throughout the lucerne and winter cereal fields to locate animal burrows. This provides data to draw-up a distribution map of the species and to assess the population development. This is what allowed us to show the decline of this species. 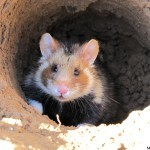 This positioning information of the European hamster is an essential tool for its preservation, as each year they are presented to the farmers who may then collectively choose the areas to plant beneficial crops near the burrows. This change to more precise methods according to species monitoring has already revealed encouraging results. 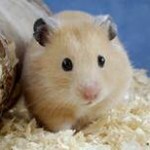 For several years now, we have seen a relative stability for both the resources and the European hamster community. To adapt the conservation tools for this species, we must assess the impact on their biological parameters, such as survival and reproduction. For this, individual monitoring is essential. 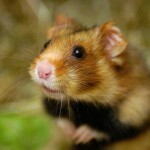 Using a receptor and a telemetry antenna, the ONCFS can follow all hamster movements, from burrow to burrow until they begin to hibernate or die. Using camera traps at burrow-entrances, we can observe the new litters and estimate the female reproduction rate. Within the context of the LIFE Alister project we were thus able to provide some recommendations regarding farming practices favourable to this species. Three quarters of the European hamster population in Alsace still remains rather sparse and oftentimes they are cut off from each other. Therefore, these populations must be reinforced by releasing animals. Since 2003, the ONCFS has implemented a reinforcement programme with individual hamsters coming from three breeders: the Naturoparc, the CNRS DEPE and Sauvegarde Faune Sauvage. Hamsters are released into artificial burrows within closed plots where the winter cereal will not be harvested. This serves as their first home, protecting them against predators. Using the recommendations provided within the framework of the LIFE Alister programme, a diversified ground cover is also sown in these plots, giving them sufficient food resources. Towards agricultural systems better able to withstand unexpected climatic events and preserve biodiversity?